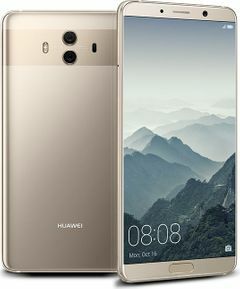 Huawei Mate 10 is currently not available in any stores. From a very long time, Huawei has been trying to make a mark in the elite smartphone segment and their latest stint with Huawei Mate 10 or P10 proves the point. P10 is designed to compete against the well established and premium smartphone brands like the Samsung Galaxy S8 Plus, Samsung Galaxy Note 8 and Apple's iPhone 8 Plus. The Huawei P10 comes with a few minor tweaks to its predecessor P9 smartphone. This is Huawei's first smartphone that has a Bezel-less display, or in simple words, an edge to edge display, similar to what Samsung Galaxy Edge series has. The Huawei Mate 10 display size is 5.1-inch with a Full HD display (1080 x 1920 pixels; ~432 PPI pixel density). The phone operates on the latest Android software that is Android Nougat and is packed with 2.4 GHz, Octa Core, HiSilicon Kirin 960 Processor. Huawei Mate 10 also has a 3500 mAh Li-ion non-renewable battery and 4GB of RAM. Huawei Mate 10 follows iPhone 7 like dual rear-facing cameras. The phone has 12 MP and 20 MP cameras on the back side and 8MP front-facing camera. Although the camera quality on the P10 is good, it’s not as great as on the iPhone 7 Plus or the Samsung Galaxy S7 Edge. The design of Huawei P10, is also somewhat similar to iPhone 6S – there’s no escaping that. In security features, the phone has a fingerprint scanner that also acts as a navigation button to go back or see the apps running on background. Looking at the storage option the phone offers 32GB of internal storage. However, Mate 10 does have a shortcomings there will be no FM radio on the phone. Though the exact date of Huawei Mate 10 launch in India is not confirmed yet we can expect the phone to come to Indian market later this year. You can subscribe to Smartprix alerts to get prompt updaets regarding Huawei Mate 10 India launch. The Huawei Mate 10 is a big phone with an excellent camera, striking design and plenty of power under the hood. The new trend of metal frames and glass fronted and backed bodies has made its way onto the Huawei Mate series, and the Mate 10 is an excellent example of this design done right. The phone’s battery doesn’t last as long .